In the podcast Osher shares stories of his “different mind” and how he’s now reluctantly on meds to tame it. His old Australian Idol co-host James Mathison gets a plug for running as an Independent candidate against former Prime Minister Tony Abbott in next Saturday’s election. The electorate is Warringah on the Northern Beaches, the site of the worst damage from the recent Sydney Storms. “Funny how fancy climate denying suburbs get washed away”, Osher says. He joins me in spruiking the joys of renewable energy, particularly those laid out in the Home Grown Power Plan. Enough sunlight falls on our planet in an hour to power the world for a year. Osher says there’s a machine called “the money maker” over in West Australia that makes $112,000 per hour digging coal. Which source of energy would you prefer? As a Solar Citizen (and a Yellow Galactic Sun in the 13 moon Mayan calendar), I’m beholden to choose the former. 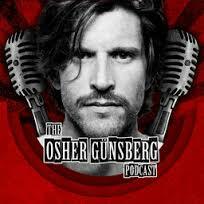 And Osher’s with me. He went to music school and found his people. I went to the environment movement and found mine. Together, we make beautiful podcasts. Spend some time with us here. ← Try pronouncing triakisoctehedron and triakisicoosahedron.